This SAP cloud ERP (enterprise resource planning) and business management software product is designed for medium-sized companies. It is designed to track end-to-end business processes across scenarios such as CRM, financial management, project management, supply chain and many more. On-demand and monthly subscription-based solution that offers built-in business analytics, e-learning and support. SAP Business ByDesign provides mid-sized businesses with between 20 and 5,000 employees a comprehensive and fully scalable Enterprise Resource Planning (ERP) solution delivered as a managed service from the Cloud. A single application that unites all of your key business functions including finance, human resources, customer relationship management, supply chain and procurement into one application. It enables you to streamline processes, drive economies of scale and gain full visibility and control of your business. SAP Business ByDesign can help you turn challenges into opportunities. Integrate and automate your professional services processes – including financials, client and project management, and more. SAP Business ByDesign enables you to streamline both HR management and HR processes. Manage time, labor, and compensation more effectively. Real-time and integrated view of your manufacturing operations. Optimise your entire process to reduce costs and meet customer needs. SAP Business ByDesign allows you to connect marketing, sales and service delivery to truly understand the end-to-end customer experience. Improve efficiency and achieve better supply-demand matching helping you to increase flexibility and streamline collaboration with supplier and customers. SAP Business ByDesign provides you with comprehensive and timely insight into every aspect of your business with comprehensive analytics. Integration of Business ByDesign with Microsoft outlook allows synchronisation of contacts, email, appointments and tasks. Generate documents in print, fax or email and external communication of business content. Allow users to setup task notifications via email. Personalise as per the user preference, quick links, latest news, embedded reports. Adjust the layout of a screen or all screens. Adapt the theme according to the business needs. Define mutli-step approvals according to your business processes. Create customised rules based on your business scenarios. 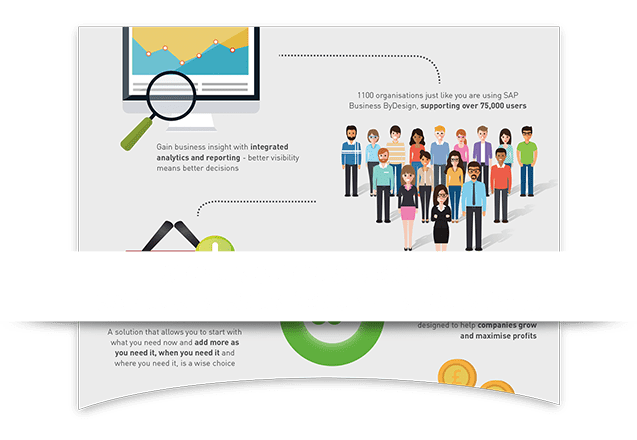 For growing mid-sized businesses we believe that SAP Business ByDesign provides the ideal solution – it is an all-encompassing ERP and Business Management Solution hosted in the cloud, delivered as-a-Service. Gain the power of the market-leading ERP solution with the complexity of deployment removed. Delivered on-demand from the SAP HANA Cloud, the software scales with your business enabling you to simply add users, locations and functionality as and when your business needs it. As a SAP Gold Partner, we have extensive experience of deploying SAP ERP solutions. We will guide you through deployment and user adoption, reducing project risk and accelerating the value that is delivered to your business. Our customers have benefited in many ways from deploying SAP Business ByDesign with Codestone; here is just some of the value delivered. This software has enabled our customers to address the core issues that were restricting growth while providing them with a business management application that grows with them in terms of both scale and evolving business requirement. SAP Business ByDesign has enabled our customers to break down business silos and seamlessly integrate every area of their business from marketing to delivery in a single, all-encompassing application that puts them back in control. With greater control comes far greater insight. The information our customers need is available in real-time removing the need to merge data from multiple applications and data sources, ensuring instant access to one source of the truth. By integrating processes, data and workflow, our customers have significantly improved operational efficiency, the productivity of their people and financial control, all of which enables them to grow while improving their bottom line contribution. Visualise what the software can do for your company with a no-obligation demonstration. 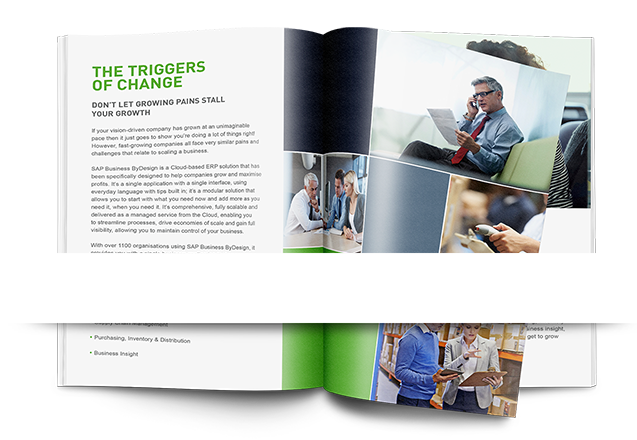 Take a look at our eBook that outlines the unique value we offer as your Business ByDesign partner. The team at Codestone combine almost two decades of SAP expertise with experience of best-practice deployment that spans a wide range of industries. We take the time to understand your business and tailor Business ByDesign to your specific needs and to deliver the outcomes that you require. As a cloud-based solution delivered on-demand, you can choose which elements of the software you deploy to who and when. The modular structure of the application enables you to scale your deployment as you address different business issues or your business requirements evolve over time.